One of the few mowed areas of the C&O canal watercourse, tow path at left, approaching Taylor's Landing. 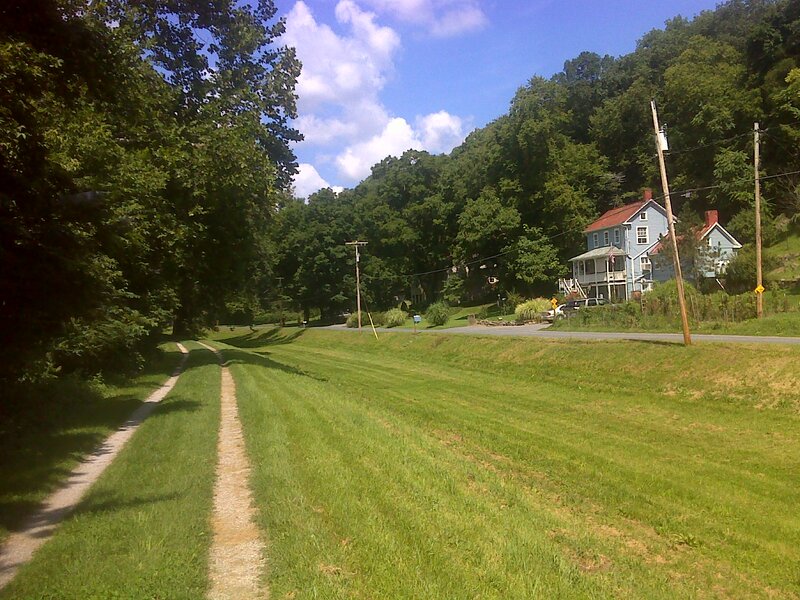 This report covers the portion of the 187 mile C&O Canal Towpath between Weverton (about Milepost 58), to Taylor's Landing at Milepost 80.8). The way I conquered this stretch of trail/path self-supported is to bike one way and hike the other, leapfrogging my bicycle with my van (parking my van at various parking areas along the route). The hiking portion of this adventure is the first part of my Personal Continuous Footpath route that extends west from the Appalachian Trail. Its immediate, or first, destination is to hike to State College Pennsylvania. The first leg of that hike follows the piece of the American Discovery Trail that is co-incident with the C&O Canal Towpath between the Appalachian Trail and the Tuscarora Trail, which I'll meet at Canal Mile Post 113.8 at Big Pool. At the other end, there's a three mile piece of the Appalachian Trail that also coincides with these other two significant trails - between Weverton and Harper's Ferry, at Mile 60.8. Okay - with all those details and statistics covered, what was the hike like? In a word peaceful. Nearly all of this section of the Towpath runs through a wild section of the Potomac with no roads adjacent. It was late summer and the weather was sunny and serene, almost no wind, so all the sounds that greeted my ears were natures sounds--birds and katydids and the occasional gurgle of a stream or the rush of rapids on the big river. Being one of the flattest trails imaginable, the walking was easy and the biking equally so. The path is well maintained gravel with just a few muddy places - a result of an inch or two of rain that had fallen a couple days before. I met about ten bikers for every runner I passed, and about two runners for every walker. But this is a very hiker-friendly route. There is a biker-hiker-only official tent camping site every 5 to 7 miles along the trail, not accessible by motorized vehicle, with a water pump and port-a-potty. These campsites all offer access to the Potomac River and are all exquisitely remote and peaceful. 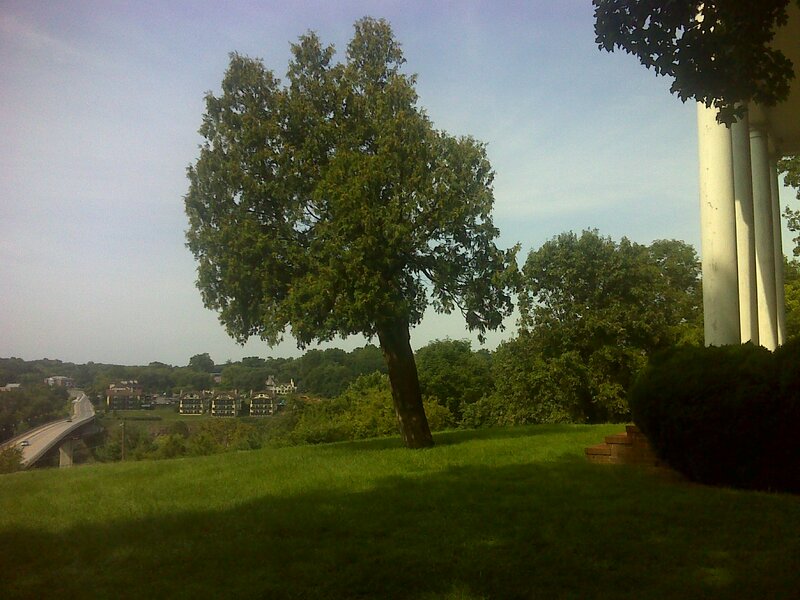 Looking across the Potomac valley to Shepherdstown, WV from the front yard of Ferry Hill mansion and visitor center. 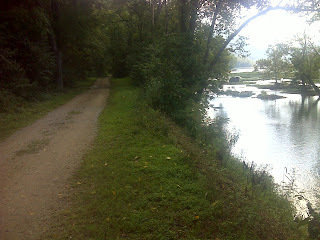 I had a chance to ride a wonderful bike path - a side trail - up to the Ferry Hill historic mansion and visitor center across the river from Shepherdstown, WV, where I had my questions answered. I learned about the devastating March 17-19, 1936 flood that washed away a railroad bridge that was all of 40 feet above the normal level of the river (the towering stone masonry piers on which the spans set are still there, and it's positively mind boggling to imagine the water was that high), and about nearby Packhorse Ford, which is normally only knee deep all the way across the river - one of the only places up and down the river where it can be so easily crossed. This ford figured in Civil War troop movements and has been in use by Native Americans since pre-Columbian times. Nearby is Antietam and Sharpsburg, which have to be the very epicenters of Civil War action. Roadside plaques abound on every street and thoroughfare in the area. 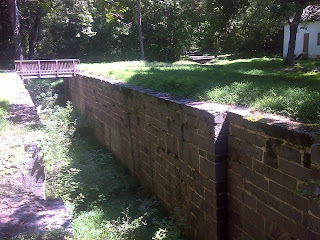 Lock 37, one of ten canal locks I passed on this segment of the towpath. Each lock changes the elevation of the water by roughly eight feet. Bottom Line: From a hiker's point of view, I have to rate this experience as one of the best I've had in my 7000+ miles of documented hiking. I give highest points for hikes that fulfill the mission of my 'Seeks It' trail name: I seek fellowship with the wilderness and a chance to commune with the forces and influences of nature. And the more the positive forces outweigh the negative ones, the better I like it. Absolutely the only negatives on this hike were a very few biting bugs - not mosquitoes or flies or gnats, not even the no-see-ums that I'm familiar with, but something that stealthily came and went and left little red welts, mostly inside clothing. Weather couldn't have been better, and the benefit/cost ratio of taking in the views was nearly infinite, unlike mountain-top views where you have to pay the price of the climb.